Donald "KodyKoala" Kennedy has worked his magic once again. Hot off the heels of his battle damaged Mega Man figure, his latest creation focuses on a similarly battered and bruised take on the Blue Bomber's brother, Proto Man. "Here is another commission that I did. I wanted to focus on Protoman’s shield for this one, and I like how the face turned out with the eyeball behind the glasses," writes KodyKoala. 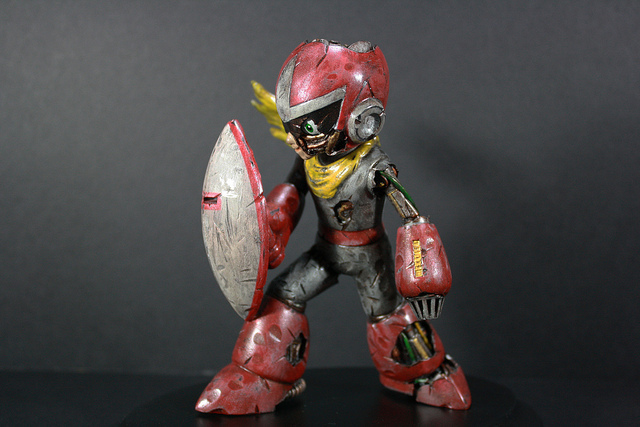 "This took me about 15 hours to complete and I used a vinyl Protoman and random robot parts and wires." You can check out more pictures of this gruesomely awesome piece on KodyKoala's Flickr gallery here. who knows he is free. It's utterly amazing what he can do to the retro rotos. He takes them to places no one expected they could travel. I wonder what Jazwares thinks...lol. LOL!!! Stupid Jazwares are probably jealous of his work because they can never do something like that! LOL!! !